the focus on food. | everything will turn out alright. one of my favorite parts of stay-at-home mommyhood is being able to put a lot of focus on what i feed my family. i have the luxury of time. time to be able to make a small daily trip to the grocery store. time to make things like bread and biscuits from scratch. time to meal plan. time to cook. time to make all of sylvie’s food from scratch. it has been a great source of pleasure for me since sweet baboo started solids. we have recently shifted things around in our budget to allow more funds to buy the best quality food we can. i am happy and proud to say we eat mostly local and organic on our very tight income. food is our top priority as a family. travis and i are of the mindset that we would rather spend our money on food (or good wine and beer) more than anything else. i love clothes and fashion as much as the next person, but if i have $50 in my pocket you won’t see me buying pants. you’ll see me buying locally raised, hormone-free, grass-fed beef to make the world’s most awesome pot roast. the reason for splurging on these items is simple: IT JUST TASTES BETTER. so here i am, a foodie mama trying to raise a foodie spawn. so far she’s a great eater. of all the foods and flavors she’s tried the only thing that didn’t sit well with her was smoked spanish paprika. i pray to juan mari arzak that she’ll learn to love it one day. her list of likes includes sweet potato, asian pear, garlic, sweet curry, cinnamon, vanilla, peas, green beans, carrots, potatoes, turnips, leeks, celeriac, herbes de provence, and schmaltz (that’s rendered chicken fat to all you gentiles out there). i’m proud of this list, but i know better than to get cocky. i know that most babies will eat like goats, but that most toddlers will pick like birds. right now my best plan to combat this picky toddler phenomenon is EXPOSURE. i plan to use this golden time of eat-anythingness to expose sylvie to as many flavors and foods as possible. tonight travis and i had one of our very favorite meals–roast chicken, roasted potatoes and carrots with butter and herbes de provence, and garlicky sauteed green beans. 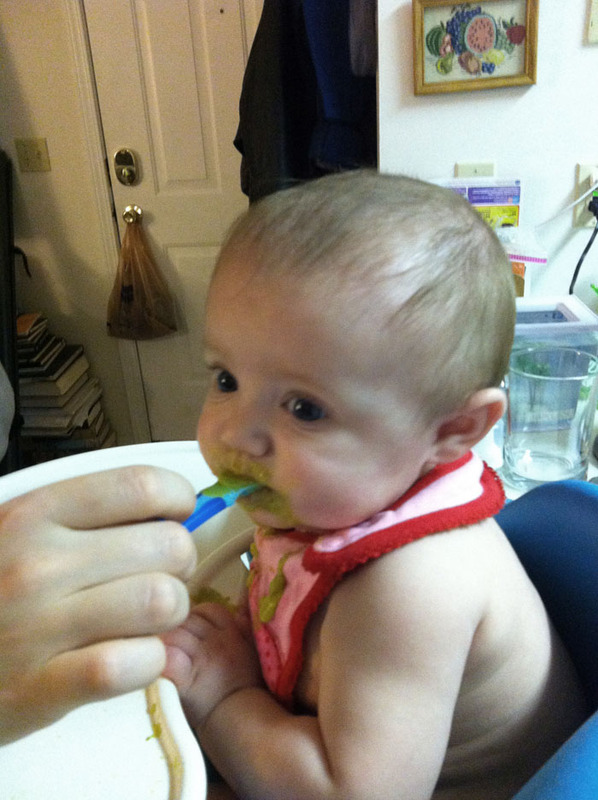 sylvie ate all of the aforementioned vegetables pureed with schmaltz and warm water. she loved it. i loved watching her love it. 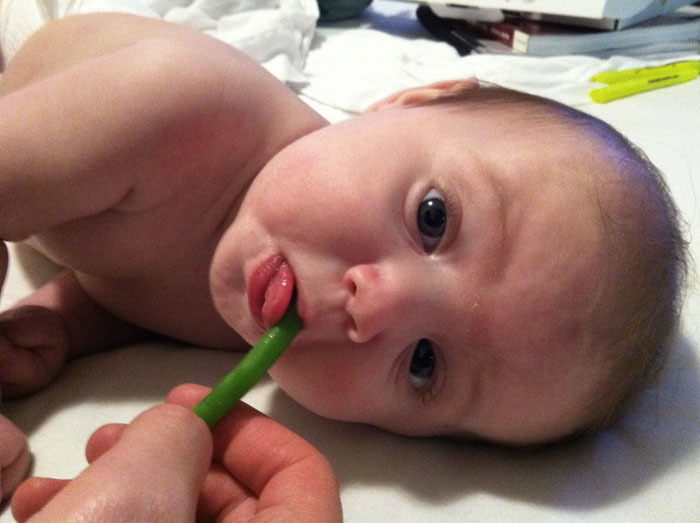 while i cooked, sylvie teethed on a cold green bean and hung out in bed with her daddy. i love letting her explore food in this way. we’re not doing baby-led weaning per se, but i do let her gum on some whole foods as well as practice spoon feeding herself. we seem to have found our happy medium, and meal times with sylvie at the table are a complete joy. i am so thankful to have this time with my young daughter as i watch her learn and explore her food and her world. 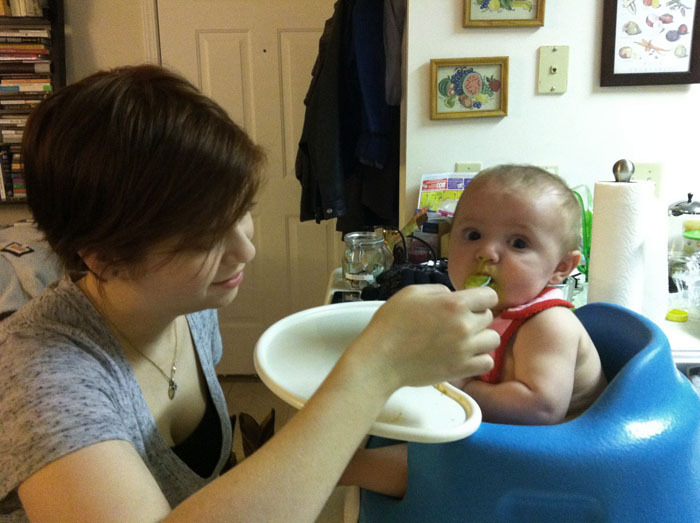 This entry was posted in Uncategorized and tagged 5 months, baby-led weaning, food, purees. Bookmark the permalink. Good for you! Good food is so important! We just bought a 1/2 grass-fed beef and it is SO yummy! The Feeding Baby Green book talks about exposing them to all sorts of food during this period. Sounds like you’re right on track! Our kids have all eaten similarly to Sylvie and they are more willing to try new things and like things other kiddos don’t. They all love broccoli and last night the boys ate some cabbage slaw that I was surprised they enjoyed. Keep up the good work! Do you have a hand blender? I didn’t have one until E and I LOVED it! I have a great hand blender and LOVE it. I use it to make big batches of food to freeze for her. When I’m just pureeing up a little of what we’re eating I use our Magic Bullet. It works fantastic and the cup is small enough to feed her straight from it. I am SO with you on this! We are the same way in my family – we put all extra dollars (and there aren’t many!) in our food budget so we can have fresh, local, and good quality food. We’ve also been blessed with a baby that loves to try different things and has taken well to different spices. Many people have commented that will all change when he reaches toddlerhood, but I can’t help but think “If you don’t want a kid that only eats goldfish crackers, maybe you just shouldn’t feed them junk at all.” Could it be that simple? Who knows – for now I’m just happy to have a little guy that loves food just as much as his parents. I think for some kids it really could be that simple. I guess we’ll both just have to wait and see!